ISLAMABAD, Nov 3 (APP): Minister for Interior and Narcotics Control, Chaudhry Nisar Ali Khan on Thursday said Frontier Constabulary and other Law Enforcement Agencies (LEAs) belong to Pakistan and not to any particular province. He rejected Chief Minister Khyber Pakhtunkhwa (KPK), Pervez Khattak assertions and said these agencies should not be dragged into politics. Addressing a Police Darbar at Police Line here, he eulogized Police, FC and Law Enforcement Agencies for establishing writ of state and maintaining law and order during recent critical period in the Federal Capital. “Police of Pakistan and LEAs ensured rule of law and sent a message to the world that an armed mob cannot impose its opinion upon government or upon any city of the country,” he said, adding that there were no winners or losers rather only Pakistan won. “Pakistan and its future generation emerged victorious after leaving behind a tense political atmosphere of the last few days. The Minister said extra security and full protocol were given to Pervez Khattak as Chief Minster on November 2 (Wednesday) and added that he would always be welcomed to Islamabad as Chief Minister. Ch. Nisar asked him not to misguide the public to achieve the political motives. The Minister said the government in order to maintain law and order barred those groups who were bent upon to spread violence in the Capital. He said a particular group was not allowed to paralyze the Capital and “I must commend our police which showed courage and valour to thwart their design. He rejected propaganda about permission given to Difa-e-Pakistan Council (DPC) to hold a public meeting in Islamabad despite imposition of Section-144 and said the Council sought permission and accepted conditions proposed by District Administration for the purpose. He also reminded critics that DPC is not an outlawed organization as it includes parties like PML(Q), Jamat-e-Islami and JUI (Sami). Ch. 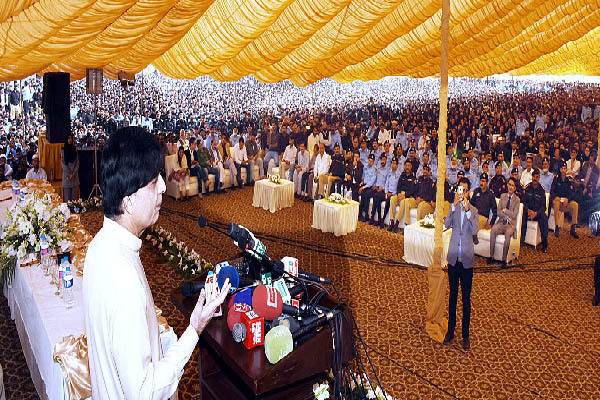 Nisar said that government is well aware of the responsibility of police and LEAs and has increased salaries of FC personnel by fifty percent immediately and remaining fifty percent in June next. against about Rs. 17,000 at the moment. FC personnel would also get internal security allowance irrespective of where they are deployed, he added. The Minister said it would be his endeavour to have a major hospital, college and university for the children and families of FC personnel. He announced award of medals, Commendation Certificates and cash prizes for those personnel who were deployed for security duties in Islamabad and Punjab during political tension. In his welcome address, Inspector General of Police Islamabad, Tariq Masood Yasin said the way Ch. Nisar Ali Khan led and guided the security team to protect the state and in establishing writ was commendable. He also appreciated the performance of police and FC who stood by state and law despite the lockdown onslaught. Superintendent of Police Headquarters Islamabad, Sumaira Azam also spoke on the occasion and commended performance of police and FC.